Elizabeth Atherton, left, and Sally O’Brien work on placing their photos, taken in front of a green screen, into pictures of places from medieval France. The book’s full title is The Inquisitor’s Tale: Or, The Three Magical Children and Their Holy Dog, and Neshobe School library media specialist Hannah Fjeld has challenged these kids to think about: what if there were four magical children – and they were the fourth. What would that look like? But the students aren’t just imagining this possibility. They actually have a green screen in their school library and they are using it to place themselves in medieval France, along with the characters in the book. Those characters have some pretty fantastic adventures. And one fifth-grader wondered why the author chose to tell their stories in this novel, a nominee for this year's Dorothy Canfield Fisher Book Award. Adam Gidwitz: “That’s a great question, Jaylee. My wife is a professor of medieval history; she studies the Middle Ages. And, for her work, we had to go and live in France for a year. I say, ‘We had to.’ It was awesome. And I came across all sorts of crazy stories while I was there. 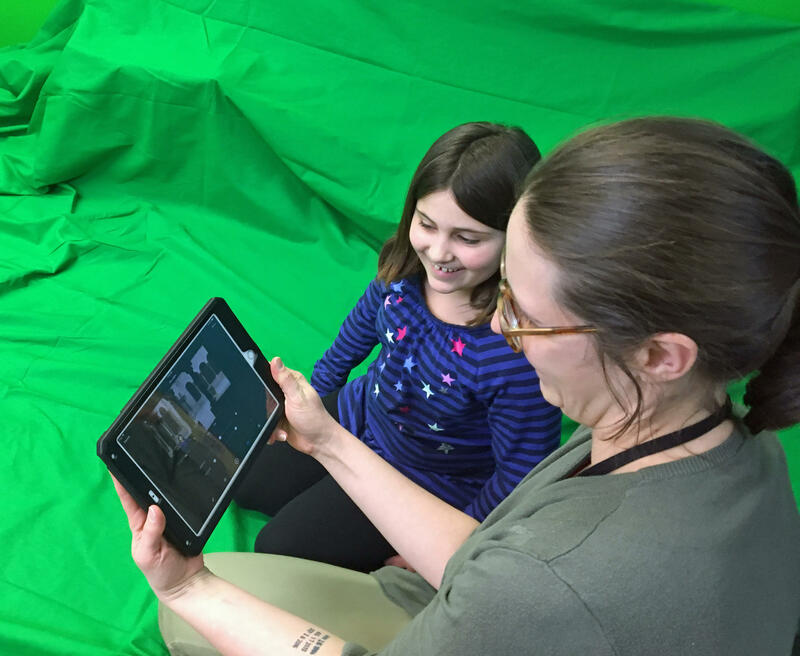 Fourth-grader Hannah Bertrand and librarian Hannah Fjeld work on putting student Hannah’s green screen photo into a medieval French cathedral. OK, there’s more to hear about that gaseous dragon in a bit. But first, let’s learn about the three children referenced in the title – Jean, William and Jacob. Each has a magical power, but they also each have a set of challenges to overcome. Jean is based on Joan of Arc – she has visions of the future. That’s a dangerous talent, as people were killed if they were thought to be practicing witchcraft. Jacob is persecuted for being Jewish, yet he also has a gift of amazing healing powers. William is a young monk with super-human strength, which can be both a blessing and a curse. His father was a European lord fighting the Muslim kings of his mother’s homeland in Northern Africa. One fourth-grader had a question about the characters' struggles. Gidwitz says the characters Jean and William came from stories he found, but he invented the character Jacob specifically to deal with a challenge. Adam Gidwitz: “Sometimes I had the character first. I had heard stories about a girl who had visions of the future, and so I wanted to have a girl like that in my book. I had heard about a monk who had been attacked by fiends in a haunted forest and had to beat them off with a donkey’s leg. I wanted that guy in my book. So I had the characters first. 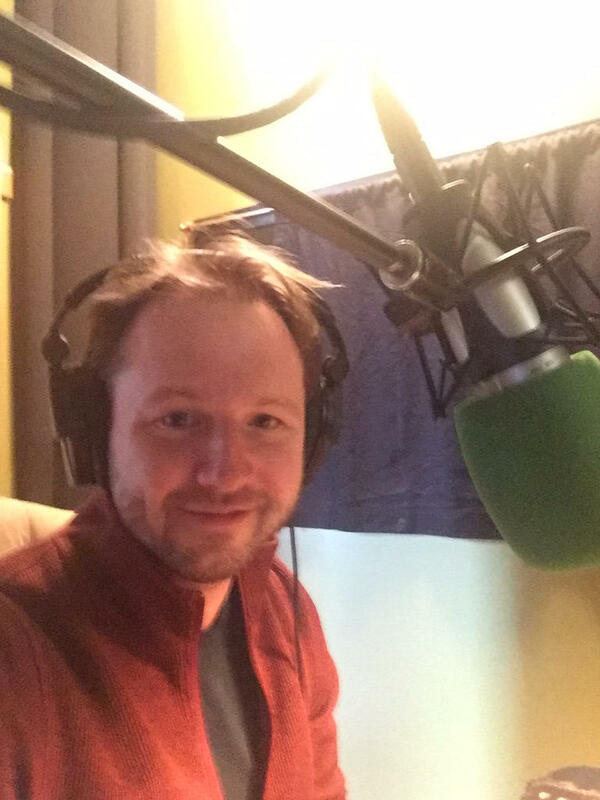 Author Adam Gidwitz snapped a selfie while recording the answers to Neshobe School students' questions about his book "The Inquisitor's Tale." "Other times I had the problems first. When I was living in France, we went to a museum of Jewish history and we saw a plaque in the museum explaining that there were no Jewish books from before 1242 in the museum, because all of the Jewish books that were not bibles in 1242, and earlier, were burned in the center of Paris. "Every book was made by hand. They were gathered into the center of Paris and they were burned. This was something that I wanted to write about, because it’s very, very upsetting. And so I wanted a Jewish character who would be able to grapple with this. And so, Jacob, the Jewish boy, has a problem before he even existed. So, sometimes the character was first, and sometimes the problem was first." In the book the three children, from different parts of France, meet up and join forces. The story also has a narrator — a mysterious character, who doesn’t actually do much of the storytelling. That’s because he hasn’t met the children yet. Along with the narrator, the reader pieces everything together from stories told by people at an inn, including a butcher, a companion of the king, the innkeeper, and an odd little nun who seems to know more than she should. One fifth-grader wanted to know more about that strange nun. Gidwitz says, while the various people at the inn could tell the children’s stories, there was still something missing. Another storytelling convention in The Inquisitor’s Tale is an illustration style called illumination, which sparked one sixth-grader's curiosity. First, Gidwitz explains what illuminations are. And Gidwitz says he wanted that to happen in his book too. Adam Gidwitz: “And so I asked an amazing illustrator, his name is Hatem Aly – he is a Muslim guy who was born in Egypt and now lives in Canada – to illuminate my manuscript. … I asked Hatem to do some drawings that illustrated what I was writing about. Other drawings could just be doodles – sort of whatever he felt like scribbling in the margins. "And he drew, for example, a fantastic two-headed cat in the margins of this book. And sometimes, I invited Hatem to draw things that disagreed with what I had written in the book, so that we could also have multiple perspectives on the same page." 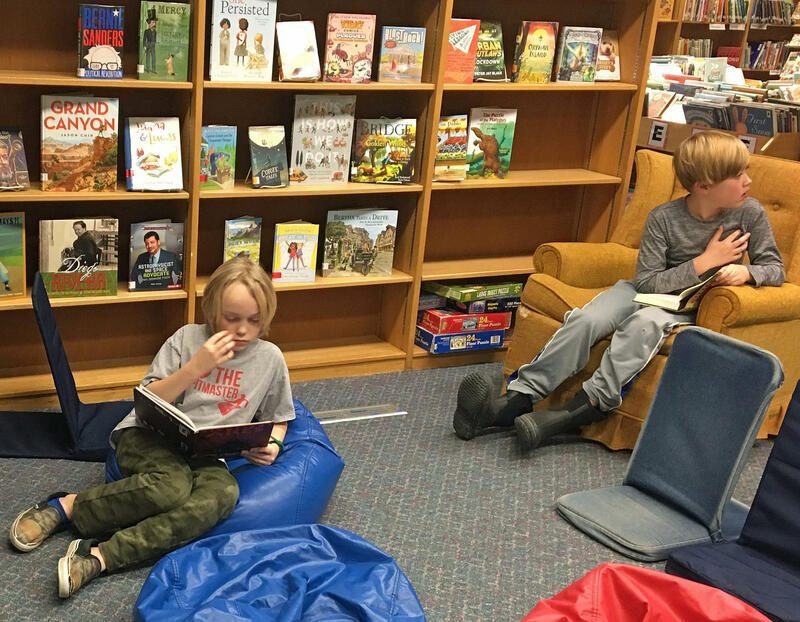 With all the technology-aided activities going on, Oliver Lavelle, left, and Jackson Howe take some time to enjoy books in the library’s reading corner. And, in case you’re still waiting to hear more about that dragon with gastrointestinal issues, you're in luck thanks to one fifth-grader's question. Oliver Lavelle: "What inspired you to come up with the farting dragon?" Adam Gidwitz: “Well Oliver, that is not only a great question – probably the most important question that could be asked about The Inquisitor’s Tale. There is, indeed, a farting dragon. And why in the world would I write about something like that? Well, the answer is, I did not invent the farting dragon. "There is a book from … about 800 years ago, called The Golden Legend, where an author collected the lives of saints. And there are hundreds of saints’ lives in this collection of … stories. … One of them is the life of Saint Martha. "And in the life of Saint Martha, Saint Martha has to perform many tasks. And one of them is to confront a dragon. And, in the book, it says that the danger with this dragon is that when anyone attacks it or confronts it, it turns and then – I quote, ‘casts behind it its odeur. And whatever it toucheth, burneth like fire.’ In other words, when the dragon fart hits you, you burst into flames." And our last question for the author comes from a fourth-grader. Hannah Bertrand: "Do you believe in magic?" Adam Gidwitz: "Woah. Do I believe in magic, Hannah? Absolutely. Sometimes the magic … seems supernatural, and isn’t. Sometimes something is very obviously natural, but is also magical. And sometimes there’s just stuff we can’t explain. And you know what? It could be magic. I write about magic in most of my books. And I think it is both awesome and, in one sense or another, definitely real." Special thanks to Neshobe School library media specialist Hannah Fjeld. Find more episodes of Dorothy's List here.